I enjoyed this story for the most part. The lifestyle that Lavinia had been living as an actress was very different than the main characters of most Regency romance books I've read. I had no idea that in those times, actors and actresses were considered so far beneath those of the ton. (Not really surprising though. They were kind of a snooty lot, weren't they.) 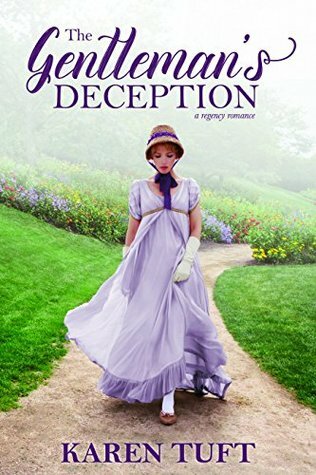 The deception that Lavinia and Lucas were involved in was intriguing and it was interesting to see just how far they would keep it going. The romance part of the story just...wasn't romantic for me. I liked both Lavinia and Lucas, and they seemed to have a good rapport, but when it came time for the romance to happen, it just kind of seemed forced to me. I was disappointed in the story because of that. Other than that, (and yes, it's kind of an important part) I did enjoy the story. This was a fun quick read. My favorite thing about this story is that it was about an actress. Normally in the regency I read they might be mentioned, but it's never a good thing when they are. It was fun to follow Lavinia around and see her choices and her personality. And let's face it, her companions are really awesome and fun to read about. When we first meet Lucas I kept trying to remember him in Tuft's other novel The Earl's Betrothal. Actually, I was trying to remember that story period. I think I need to go back and reread it to refresh my mind on it's story and plot and figure out Lucas in that story. He was very enjoyable in this story. Kind, but flawed (just like good characters should be). The ending was a little disappointing to me. I didn't really feel like the threats that were made were really incentive enough. Which, if you haven't read the book yet that won't make sense, but I don't want to spoil anything. I'll read this again...maybe after I go back and remember what the first one was about. Oh, that being said, it's a stand alone novel. You definitely don't have to read the other one to enjoy this one.